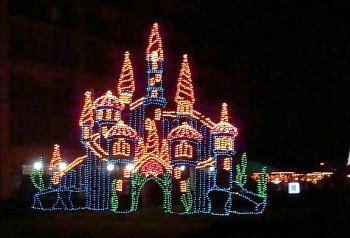 Finally giving Busch Gardens a run for their money, Kings Dominion Winterfest opened this year to give Virginians another option for holiday fun. The park is billing the event as "the ultimate holiday celebration" featuring "millions" of lights, a 300 foot tree, 12 live shows, 34 strolling performers, hands-on holiday activities, holiday foods like smoked turkey and carved ham, as well as hot chocolate and holiday desserts, and 21 open rides. Park operating dates are as follows: Nov. 23-25, Nov. 30, Dec. 2, Dec. 7-9, Dec. 14-23, Dec. 26-31. Park hours are 5 pm to 10 pm on operating nights up to Dec. 21, when it changes to 4 pm to 10 pm. The park is open 4 pm to 1 am on Dec. 31. Online Single-Day Ticket: Ranges from $25 for adults to $29.99 (depends on the night) and is always $22 for juniors/seniors. You'll find the best prices on Sundays and Fridays up through mid-December. The park is offering a Winterfest All-Inclusive ticket for $45, which includes a single-day admission, parking a single meal deal, and a souvenir mug. The park says the deal is a savings of $37 over buying these things ala carte. If you don't want to have to buy your ticket in advance and want to retain flexibility on what date you visit, but still want to save some money, their Good Any Night Ticket is your best option. Buy online, and this ticket is $31 for adults and $22 for juniors/seniors. Members of the military can go online and order tickets for admission (good anyday) for just $22. Buy your parking online in advance and you'll pay just $17 instead of the at the door $20. If you want to save money on food, your best bet is to bring your own. But if that's not an option, take advantage of their Single-Meal Deal for $14.99 and their Winterfest Souvenir Mug which gives you free hot chocolate refills your first visit, and $1 refills each subsequent visit. If you're a season pass holder, you can buy tickets for a friend for just $19.99 (up to 6 tickets). Bring a Friend dates are: Dec. 2, 7, 9, 14, or 16. This "deal" is a little tricky if you want to debate whether it's really a deal. Buy your tickets through this site and you'll pay $21.90 per ticket BUT once you add in the processing fee it's really $28 for a single ticket. That's still cheaper than the regular "good anyday" price of $31. But if you can get a group of friends together, the processing fee is easier to swallow. For example, if you buy 6 tickets, you'll pay about $23.50 per ticket. To use the deal, go to www.kingsdominion.com/save, and enter "KDVRPS" for BOTH the user name and the password.